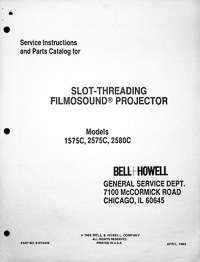 Photocopy of the original photocopy of the original 1987 Service and Parts manual for the 16mm Bell & Howell slot-load movie projector models 3580 and 3592 (can also be used for the identical Eiki SSL models of self-threading projectors). 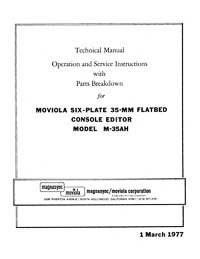 Photocopy of the original 1987 Service and Parts manual for the 16mm Bell & Howell Autoload movie projector models 3585 and 3592/AX (can also be used for the identical Eiki SNT/ENT models of self-threading projectors). Photocopy of the original 1975 Service and Parts manual for the 16mm B&H 1545, 1550, 1552, 1545EX and 1552EX Automatic Threading Filmosound projector. Photocopy of the original 1986 Service and Parts manual for the 16mm B&H 1575C, 2575C and 2580C Slot-Threading Filmosound projector. Photocopy of the original 1976 Service and Parts manual for the 16mm B&H 1580 Slot-Threading Filmosound projector. Photocopy of the original 1977 Service and Parts manual for the 16mm B&H 1585, 1590 and 1592 Automatic Threading Filmosound projector. Photocopy of the original 1986 Service and Parts manual for the 16mm B&H 1595C, 2585C and 2592C Automatic Threading Filmosound projector. 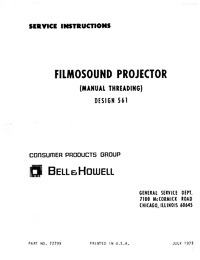 Photocopy of the original 1963 Service Instructions and Parts Catalog for the Bell & Howell Filmo Projectors Design 173 & 273. This manual covers models 173B, 173BA, 173BD, 173BDA and 273A. 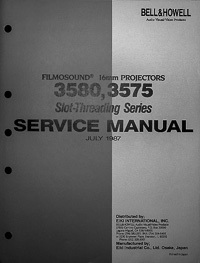 Photocopy of the original 1980 Service and Parts manual for the 16mm B&H 2580 and 2582 Slot-Threading Filmosound projectors. 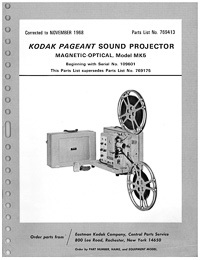 Photocopy of the original 1980 Service and Parts manual for the 16mm B&H 2585, 2590 and 2592 Autoload Filmosound projectors. 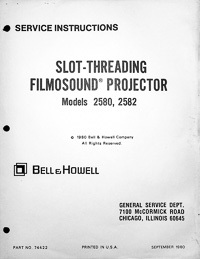 Photocopy of the original Service Instructions and Parts Catalog for the Bell & Howell 561 Filmosound 16mm Movie Projector. 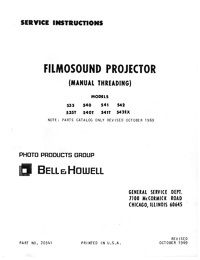 Photocopy of the original Service Instructions for the Bell & Howell Filmosound 535, 540, 541, 542 16mm Movie Projector.